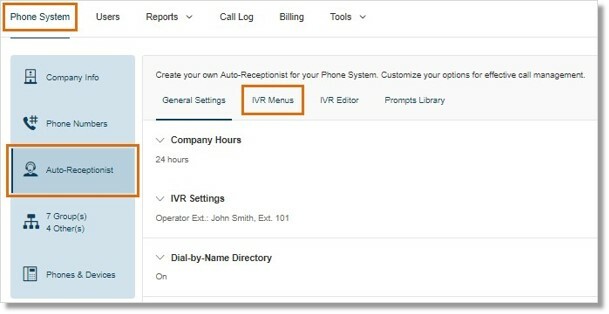 The AT&T Office@Hand Multi-level IVR is a hierarchical menu structure that expands the capability of the current Auto-Receptionist feature. Office@Hand extends your Auto-Receptionist capability by providing system administrators with the flexibility to simplify inbound call flow configurations with the use of advanced menus. A dentist office provides services to both English and Spanish-speaking customers, and would like to offer callers a bilingual Auto Attendant feature based on their language selection. The IT manager can configure two separate voice menus, one in each language, to provide selections such as office hours, appointments, and billing. Let’s say a nationwide furniture retailer has five stores located in San Francisco, Chicago, New York, Dallas, and Miami. Each store has its own direct business number and automated menu to serve local customers. To better brand the retail chain, the IT Manager sets up a main toll-free number for its Auto-Attendant system, and connects all local phone menus to route incoming calls to stores nationally. Create and implement flexible IVR menus for handling incoming calls. Get centralized phone routing management for multiple locations/offices via cloud-based services anywhere, anytime. Optionally add a direct number (DID) for each IVR menu independent of the main company call handling. 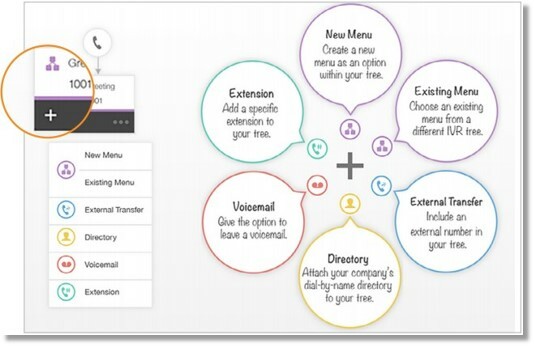 Create up to 250 IVR menus per account, including sub-menus. Use the intuitive graphical Visual IVR Editor to manage and configure your company’s automatic attendant–from your Online Account or from a tablet. Import XML files for quick deployments and bulk changes. Easily create IVR prompts with flexible options: text-to-speech, self-record, or file import with professional recordings (supported audio files: MP3 and WAV). Summarize results of any mis-configuration, such as non-existing extension or missing prompts, with validation function. Easily customize inbound call routing and telephone prompts for after-hours and holidays. 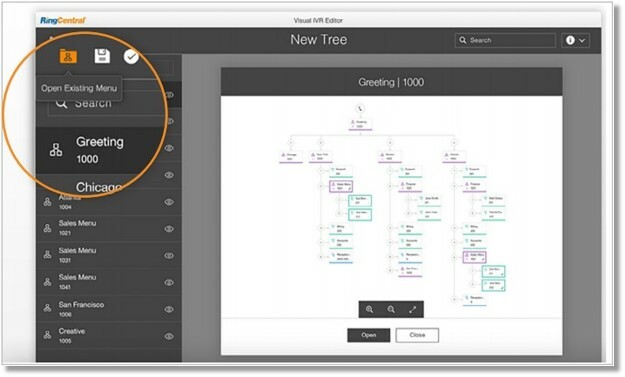 AT&T Office@Hand offers IVR Tools to configure phone tree menus, including an easy-to-use Visual IVR Editor, as well as tools to add/manage prompts and import/export XML files. 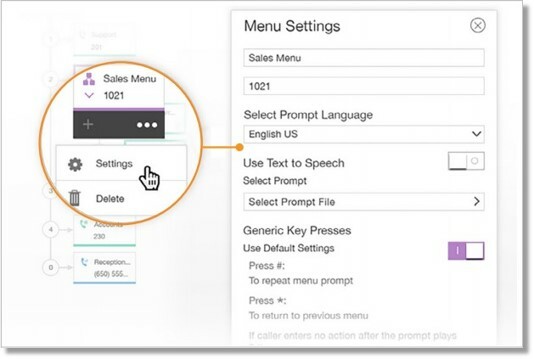 Use the Visual IVR Editor to open an existing menu or create a new one. Click on IVR menu names, extensions numbers and keys for easy customization. Configure an IVR menu with a pre-recorded prompt, a text-to-speech greeting, or a special touch-tone key setting.